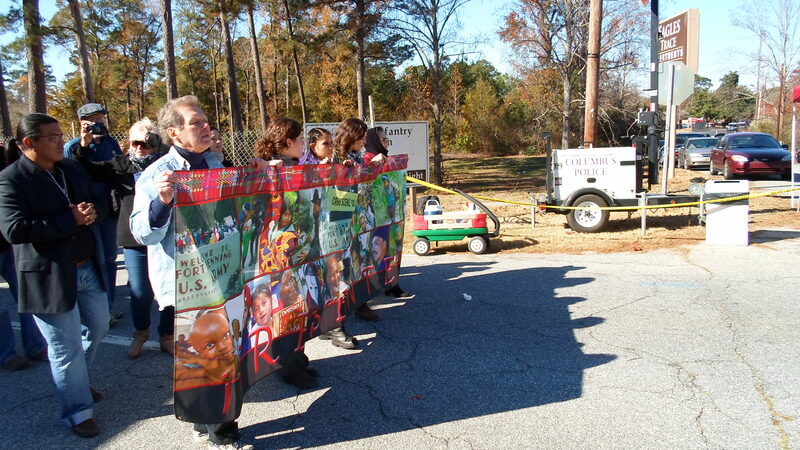 I went to the SOA Watch gathering and demonstration the weekend of November 22-24,2013. It was amazing to see the diversity of age, gender, race represented by those present for this weekend. Nonviolence was present throughout the weekend by the demonstrators. Infiltration of movement by plain clothes police officers was readily apparent. Some were the same officers who infiltrated the group last year and then testified at the trial. We counted about 10 officers, but the commander suggested there were quite a few more. A police helicopter buzzed the group (flew at about 100 feet above) causing some to duck from fear of being hit and causing some of the vendors to run after t-shirts that were now flying around the concrete. When does national security become a pretext for attacking freedom of speech? SOA Watch has filed a Freedom of Information request with the Columbus Georgia police to get any files they might have on the demonstration/demonstrators. Our message remains the same. Shut Down the School of the Americas by any name. It has caused the grief and torture of our brothers and sisters in Latin and Central America for too long. This continues and so shall we continue to protest it. Our faith demands this of us.